The brand new Hampton Inn & Suites is conveniently located off of I-79 exit 153, 4.5 miles from West Virginia University & only 17 miles from Coopers Rock State Forest. Walk to a WV Black Bears game or enjoy a variety of restaurants and shopping right here in Granville Square. We offer fresh complimentary breakfast, and free premium Internet access to all of our guests. If you’re staying in for the night, enjoy an evening by one of our outdoor fire pits, or cook dinner on our barbecue grill. We also offer 24-hour complimentary coffee, a fitness center, an indoor heated pool and a guest laundry facility. All guest rooms come fully equipped with mini refrigerators, coffee-makers, microwaves and the most comfortable Hampton beds! 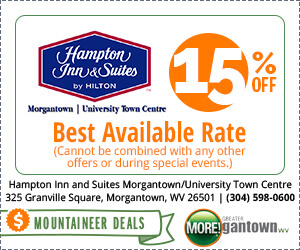 Come stay with us and enjoy all that Morgantown has to offer!